Needle container in Starbucks washroom. This is a male/female washroom. The door is not locked unless someone is inside and locks the door. 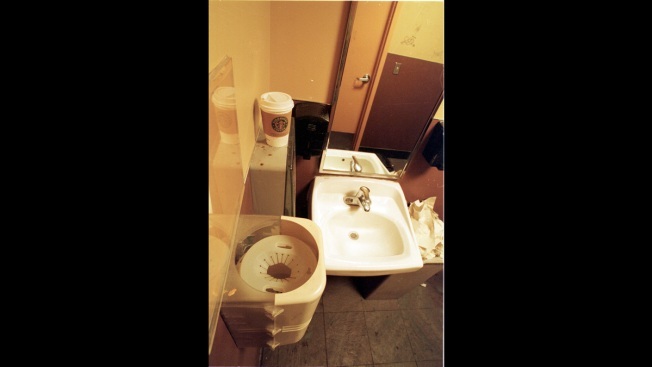 Starbucks is exploring installing needle-disposal boxes in the bathrooms of certain stores to provide a safe way of throwing out syringes and other drug paraphernalia, NBC News reported. The company's announcement comes after more than 3,000 people signed a petition on Coworker.org calling on the coffee giant to provide a safe way of disposing of needles used for drugs that are left inside bathrooms. "These societal issues affect us all and can sometimes place our partners (employees) in scary situations," Starbucks said in a statement Thursday. The company announced in May a new policy that allows anyone to sit in their restaurants or use their bathrooms, regardless of whether they make a purchase. The online petition says, "Employees risk getting poked, and DO get poked, even when following 'protocol' of using gloves and tongs to dispose of used needles left in bathrooms, tampon disposal boxes, and diaper changing stations."